Sherlock Holmes: When you have eliminated the impossible, whatever remains, however improbable, must be the truth. Charlton Heston, late in his career, takes on the role of Sherlock Holmes in this made for TV movie based loosely on The Sign of the Four. Set in 1897 in London, the story begins with Watson writing the story, which he says due to its nature he is going to leave unpublished. The story really begins thirty years before, in 1867 India, during the Great Mutiny. One of the Indian soldiers asks a British office to help him seize a maharajah's treasure during the confusion of the rebellion and he agrees to join in. When he is caught in the act, he lets two other officers join in but they have to kill two of the Indians. The men form a pact to never tell what has happened. 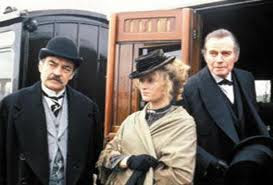 When we first meet Holmes he is being castigated by Watson for his drug use, which is brought on his his inactivity. Then Irne St. Claire appears and looks to get Holmes help with her father, Neville St. Claire, who was one of the officers involved in the theft from the maharajah. Her father lives under the fear of a curse, and is now a helpless opium addict. When he needs money he goes to his fellow conspirator, Alistair Ross. When Sherlock pays a visit on Ross with the parchment Irne had received, with a Crucifer (cross) written in blood with the oath the men took long again. The third man involved in the pacr Jonathan Small is missing, and a mysterious man shows up asking about the jewels and then an ape-like creature shows up, and Ross is killed, poisoned by a thorn. The movie drags a little, but has good production values and has a pretty good surprise ending. Overall, well worth seeing.